Russia’s annual International Economic Forum held in St. Petersburg agreed to work together with Boao Forum for Asia, which is expected to create new investment opportunities across Russia, China and other Asia-Pacific states. “The Boao Forum for Asia is the biggest in the region and one of the most representative in the world. By participating in the Boao Forum and cooperating with it, we gain a great opportunity for understanding Asia better and expanding our potential for economic collaboration,” Sergey Belyakov, Chairman of the Board of SPIEF Foundation said in a statement Monday. 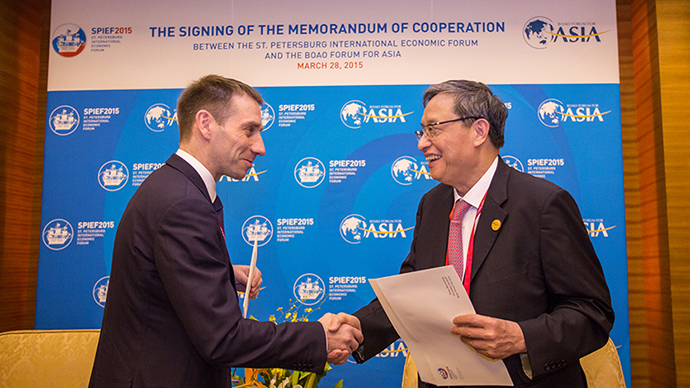 The memorandum of understanding was signed on March 28, 2015 within the framework of the Boao Forum. “China and Russia are two big countries with good relationship. [Boao Forum for Asia] is based in China, and aimed at promoting regional economic integration. Russia is an important part of Asia, therefore it is of strategic importance for BFA and SPIEF to establish cooperation,” said Zhou Wenzhong, Secretary General, Boao Forum for Asia. Zhou added that the agreement was just a starting point in strengthening cooperation in the region.